When PVD is employed to coat a 3-dimensional object, certain areas of the surface may come into the shadows cast by its own protruding structures. Here, we speak of the self-shadowing. Self-shadowing commonly occurs in coating of photoresist-patterned semiconductor wafers, automobile parts, medical devices etc. 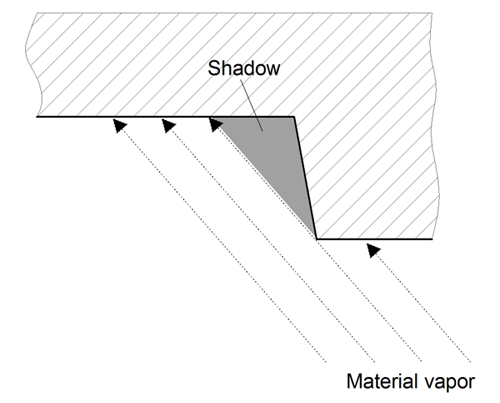 To correctly predict the thickness distribution on these surfaces, a realistic model of PVD must take into account the obstruction of vapor due to the self-shadows. One of the computational approaches in modeling self-shadowing is the use of shadow masks. To model self-shadowing, one can introduce negative shadow masks, which allows vapor to pass in designated areas while blocking passage everywhere else, in shapes conforming to the shadow-casting structures. If mask rotations are available, then the conforming masks can "adhere" to the coated parts which undergo rotations in the coating process. Modeling tools with these capabilities can precisely simulate self-shadowing effects. A PVD modeling software, V-Grade 5S, produced by Tin Model LLC, is suitable for this purpose. The following are two cases, studied with V-Grade 5S, where modeling of self-shadowing is essential to the correct prediction of resulting thickness distribution. The parabolic reflector to be coated is 10 cm in diameter and 5 cm deep, and is mounted on a planetary-rotation fixture. As it revolves in its orbit, the center of the parabolic reflector spends much of the time shielded from the material vapor by its own wall. The correct thickness distribution, shown below, is a result of modeling the self-shadowing with a rotational and negative shadow mask that is "affixed" to the rim of the bowl. An erroneous prediction by withdrawing the shadow mask is also displayed, on the left side, for contrast. In a common technique of semiconductor manufacturing, i.e. the lift-off process, a layer of photoresist is patterned on a wafer to cover areas not to be metallized. To achieve good results the photoresist is often sculpted to have an overhang in its profile. This profile, or any profile of a photoresist, can be modeled in V-Grade 5S; its self-shadowing can be simulated with the help of the shadow-mask function of the program. Here, we study the deposition of a metal wire that situates near the edge of a 4-inch-diameter wafer and runs perpendicular to its radius. The wafer is mounted tangentially on a spherical dome. A numerical array is created to represent the 3D surface with an overhang, as shown below. The shadows created by the photoresist during deposition are modeled via two negative shadow masks that choke the two corners of the overhang. As the masks rotate with the wafer, they cast shadows in the same way as the photoresist. 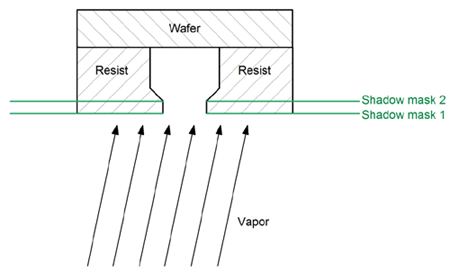 The result, exhibited in the false-colored and value-labeled maps below, shows the wire profiles on the wafer - the overhang clearly prevents the photoresist wall from being coated even though the material vapor deviates significantly from perpendicular incidence. In conclusion, advanced shadow mask functions offer an effective simulation of the self-shadowing effects in numerical modeling of PVD. With this method, thickness distribution on 3D objects can be accurately predicted for many situations. For additional information about V-Grade 5S software please contact Tin Model LLC.